Guys Lit Wire: Extinct... or Not? 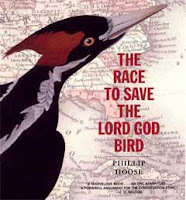 There's a lot that I like about The Race to Save the Lord God Bird. And a lot that makes me crazy. I like the story of the Ivory-billed Woodpecker, a bird that is close to extinction, if, indeed, it still exists. The author, Phillip Hoose, has worked on the staffs of the Nature Conservancy, the Sierra Club, and the Natural Resources Defense Council. He's also a songwriter, a performing musician, and a founding member of the Children's Music Network. Very cool. His writing is thoughtful and compelling. What makes me crazy, though, is the incredible ignorance. In the late 1800s and into the twentieth century, rare birds were hunted and killed, to be sold to collectors. And "by about 1870... many American women wouldn't think of buying a hat that wasn't topped by at least one long bird feather." "Some of the hat brims were like small tabletops, holding up great heaps of feathers. And it wasn't just feathers: one of the... most admired styles contained the beak, claws, and legs of a dead crow." An ornithologist (one who studies birds) in 1887 walked two blocks in New York City. Frank Chapman counted 700 hats, and 542 had feathers sewn into them. The Ivory-billed Woodpecker's habitat is practically gone from the earth. Vast old-growth forests in the southern U.S. have been wiped out. The last confirmed sighting was in Cuba in 1987. I think there's a lot more awareness of the need to protect habitats and species around the globe these days. We know we need the coral reefs and the rain forests. Hoose describes the work of naturalists such as James Tanner, "Doc" Allen, John Baker, and others to give us a documented memory of the Ivory-bill and the race to save it: "Because they wrote down, photographed, and recorded what they did, these activists and scientists left us a good manual for how to fight skillfully and well. Now it's our turn to do all we can to keep other species from sharing the ghostly fate of the Lord God bird." “Andrew Wetzler of the Natural Resources Defense Council said the CITES vote is not the end of the story for the bear. For palettes fine—refined like mine. And eaten baiji cooked in wine. I have no use for scarcer fare. With what I gain: they don't compare. The hypocrites are shocked I'm sure. To keep their jobs, they smog with crude. They let machines prepare their food. Without remorse, I'd slurp that stew. By eating youth, become a kid.